Hi-fi’s pantheon is packed with products that aspire to be ‘the ultimate’, and turntables are a particularly hotly contested area. Some swear blind that Linn’s LP12 is the best deck ever made, others say it’s a Garrard, Roksan, Oxford Acoustics, Voyd, Pink Triangle, SME, Oracle or Continuum. Few disagree however, that the mantle of the world’s most impressive vinyl spinner is the Goldmund Reference. Just look at it. Could this deck ever have come out of any other decade than the nineteen eighties? A veritable ‘uber deck’, dressed to excess with conspicuous high technology, it’s the personification of the decade’s credo of ‘if you’ve got it, flaunt it’. Absurdly expensive, lavishly finished and ridiculously over-engineered, back then this was the kind of hi-fi product you’d buy just because you could. How appropriate then that it was made by a Swiss company – you could pick one up on the way back from a meeting with your bank manager in Geneva! The Reference was not the company’s first product, but the one that put the young company on the map. Back in 1978, a group of physics students designed the tonearm that was to become the Goldmund T3. By the end of the following year, it was garnering rave reviews in the US and a matching turntable was being planned. By 1981 Goldmund had the original Studio turntable on the market. At 1983’s Chicago CES however, it surpassed itself – and everyone else – with the launch of this. Claimed to offer a unique blend of “very advanced design, traditional Swiss craftsmanship and beautiful finish”, the new Georges Bernard design was like nothing the world had ever seen before. It incorporated a variety of interesting – if not innovative – solutions to the problems of vinyl disc replay. First was its massive 600x540x750mm plinth, which together with its integral ‘support table’ was finished in gold plated brass, black anodised aluminium, steel and black metacrylate. Massively heavy, its shape and surfaces were optimised to give optimum mechanical grounding (i.e. vibration transfer) in the top-to-bottom direction. At the time, turntable isolation was still a very inexact science, and this was radical thinking indeed. In conjunction with the very strong damped spring suspension, it made a top job of keeping bad vibes at bay. Next was its speed control system. Belt drive was – of course – de rigeur for any self respecting European superdeck by the early eighties, so the Reference featured a very high quality AC synchronous motor mounted in a suspended heavy base to reduce vibration, powered by a computer controlled speed regulator giving a claimed accuracy of 0.01%. Speed adjustment of +/- 4% was provided, along with a Technics-style four digit tachymeter speed display. The ’14 function’ computer even featured a resettable time counter that could keep track of your stylus’s total playing life. All this was accessed by an illuminated gold-plated touch control panel – nice! The 30kg aluminium subchassis (complete with lead inserts for damping) supported a massive 15kg platter made from a metacrylate and brass sandwich, claimed to have just 0.005cm of eccentricity. This rested on a bearing shaft machined from hardened non-magnetic stainless steel, sitting on a micron-toleranced hard bronze receptacle. The stunning servo-controlled, fully automatic parallel tracking Goldmund T3F tonearm was mounted on a 40mm metacrylate support to minimise resonances, its seven programmed movements controlled via the turntable’s control panel. Sound was superb – if not quite to the taste of many Linn-loving British audiophiles. Highly transparent, the Goldmund neither added nor subtracted much. Rather, you got a wide open window on the recording. If any objections could be levelled, it was the ‘matter of factness’ – rather than majoring on rhythms and dynamics, you got a neutral reading of the recording and all its flaws. Like a top high speed open reel tape machine, the Reference was tonally and texturally superb, delivering clarity that was a revelation by the standards of the day. 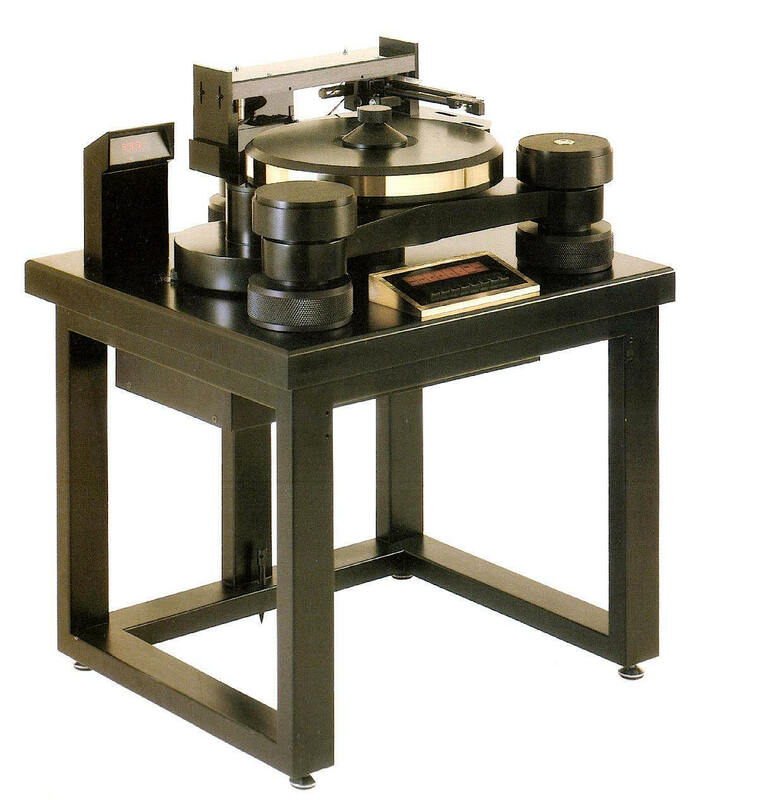 Considering that total production of the Reference ran to just 300 (whereas some 1,000 T3F tonearms exist) and its original mid-eighties retail price approached £10,000, it is unlikely that you’ll pickup a bargain in the classifieds. Nowadays these decks are treasured for their sound, period eighties styling and general rarity, so price will be a matter of negotiation between you and the seller. A powerful and iconic reminder of another age, sadly Goldmund’s website bears no mention of it now. I have one for sale in Australia. I own one in perfect condition that would like to sell. Any advice? thank you!